I’ve heard intarsia called picture knitting, and I can see why. The intarsia knitting technique allows a knitters to place a picture of any object in a knitted piece. There are so many darling kids’ knits that use intarsia to depict animals, toys, or sports items. So cute. But intarsia knitting isn’t just for kids. Take Daniela Nii’s Shaped-Intarsia Tunic, for example (below). It’s so sophisticated and interesting; and so much fun to knit! I’ve long admired this tunic, but what inspired me to write this post is Daniela’s new video workshop, Shaped Intarsia. Daniela uses the Shaped-Intarsia Tunic in her video, and it’s such a good learning tool! Yarn management is an important skill in intarsia knitting. Because intarsia uses isolated areas of color and not repeating patterns across a row, as with stranded color knitting, a separate length of yarn (wound into a yarn butterfly or a bobbin) is used for each colored section and the unused color is left dangling on the wrong side of the work and is not carried across the back. This also means that the intarsia fabric stays single layered and as stretchy as regular knitted fabric. 1: Blue yarn is old color, light yarn is new color. 2: Lay old color over new, and pick up new color to knit. This traps the old color so you won’t get a hole. Here’s Daniela to tell you about shaped intarsia, and why the proper technique makes such a difference in the finished project. 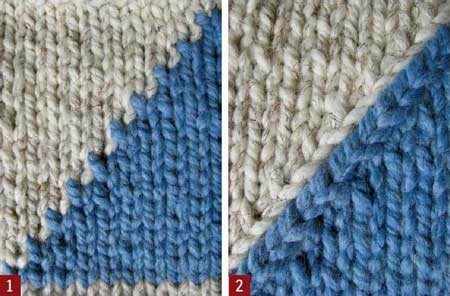 One thing you may have noticed when knitting diagonal lines in color work is the characteristic jagged or stair-step edge you get at the color changes (Figure 1, below). That stair-step might be acceptable in smaller, intricate designs but when you have large sweeping diagonals or curved lines, it blurs the strong edges and dulls the sharp delimiting lines. If you work such a design in thicker yarns that result in larger stitches, the jagged edges become even more pronounced! Shaped intarsia turns those jagged edges into smooth lines. The concept behind shaped intarsia is to tilt or slant the offending stitch that creates the stair-step effect to the left or right to create a gentler transition. It’s like creating a ramp to move more easily from one level to the next. In knitting, you force stitches to lean one way or the other by using directional decreases. You will have already encountered them if you’ve incorporated waist shaping, full-fashioned decreases, neckline and raglan shaping in your past projects. Let’s review the directional decreases: working a k2tog (knit two together), leaves the top stitch leaning to the right whereas working an ssk (slip, slip, knit), leaves the top stitch leaning to the left. Now keep in mind, since you’ve decreased a stitch to create your slant, you will then have to work a one-stitch increase to maintain your stitch count. Because of the use of a decrease to create the slant you will be able to shift the color by only one stitch per row and typically, you work the shaping on right side rows only. To apply this shaping concept to your intarsia color transition you will 1) work a decrease on one side of the color change; 2) twist the colors at the color transition point just as for traditional intarsia; and then 3) pair it with an increase on the other side. This ensures that the total stitch count will always remain the same. There’s so much to learn about this technique, and Daniela is a master at it (and a wonderful teacher.) Get her video workshop, Shaped Intarsia, and go from good to great with your intarsia knitting. P.S. Do you enjoy working intarsia projects? Leave a comment and weigh in! I love them, but weaving in the ends is always a chore. I do that in front of the TV, and before I know it, I’m done.